Recently I am working on Website with the asp.net and jQuery. While working with jquery library I found that there are 5 diffrent function that used to make ajax call to page and to fetch data. I am going to discuss about that five function one by one. Following is list of that five function availale in jquery libaray to make ajax call. Method allow to make ajax call to the page and allows to send using both Get and Post methods. As you can see in above code you can easily make call to any page by passing it Url. The call back function provide more control and allows to handle the error if any by making use of the Status value. 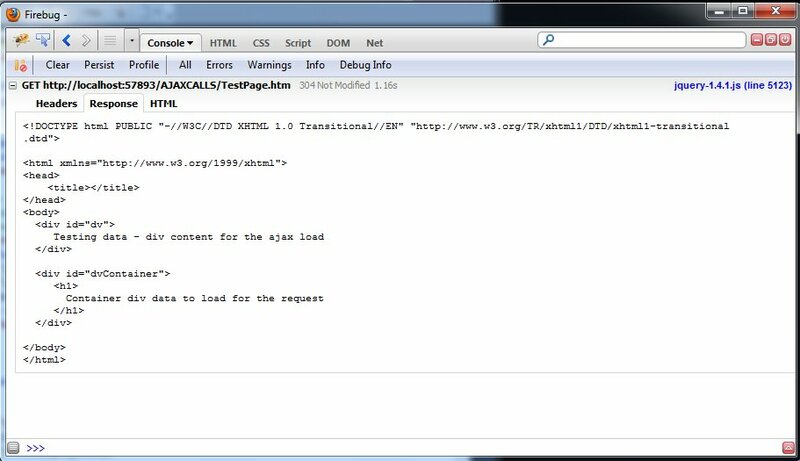 So by the passing above url to load method it just load content of the div having id=dvContainer. Check the demo code for detail. Firebug shows the repose get return by when we call the page by Load method. Allow to load part of the page. Method allow get json data by making ajax call to page. This method allows only to pass the parameter by get method posting parameter is not allowed. One more thing this method treat the respose as Json. Above code make use of getJSON function and displays json data fetch from the page. Following is json data return by the Json.htm file. Following image displays the json Data return as respose. Only send data using get method, post is not allowed. Allow to make ajax request with the get method. It handles the response of many formats including xml, html, text, script, json, and jonsp. As in code I am passing Name parameter to the page using get request. On server side you can get the value of the Name parameter in request object querycollection. Can handle any type of the response data. Send data using get method only. Allow to make ajax request with the post method. It handles the response of many formats including xml, html, text, script, json, and jonsp. post does same as get but just send data using post method. As in code I am passing Name parameter to the page using post request. On server side you can get the value of the Name parameter in request object formcollection. Send data using post method only. Allow to make the ajax call. This method provide more control than all other methods we seen. you can figure out the difference by checking the list of parameter. In above code you can see the all the parameter and comment related to each parameter describe the purpose of each one. Provide more control on the data sending and on response data. Allow to handle error occur during call. Allow to handle data if the call to ajax page is successfull. So each method of jQuery ajax is different and can use for the difference purpose. Pranay Rana. Simple theme. Powered by Blogger.